Located in the heart of the town of San Juan la Laguna, Guatemala, the Community Library Rija'tzuul Na'ooj regularly buzzes with activity. In one corner of the library, a new area provides a space for schoolchildren to partake in educational games. On the other side of the main room, younger children listen attentively as a volunteer reads aloud during storytime. And once a week, an elder resident of the community sits down with teenagers to share a little bit of his or her wisdom attained throughout a lifetime. The exterior of the Community Library Rija'tzuul Na'ooj. Photo by Community Library Rija'tzuul Na'ooj. Used with permission. However, if one listens closely, one might hear the children playing with one another in their maternal language of Tz'utujil. Books for story time are often read in this Mayan language. And the grandparents who volunteer their time to take part in the Pixab’, which provides an opportunity to teach young people traditional customs and etiquette that have been passed down from generation to generation in the Tz'utujil indigenous communities. Oral histories with village elders. Photo by Community Library Rija'tzuul Na'ooj. Used with permission. The library's name can be translated to mean “seeds of wisdom” and is located in one of many small vibrant towns along the shores of Lake Atitlán. 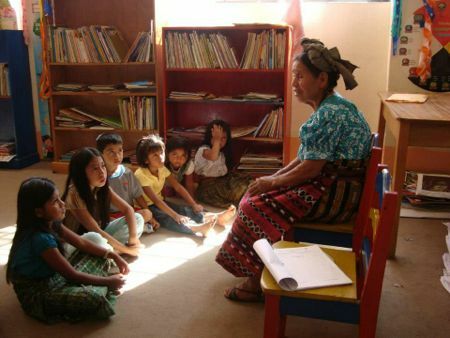 This library is also a part of the Riecken network of libraries throughout Guatemala and Honduras, which includes three libraries that comprise the Rising Voices grantee project Xela Civic Libraries. This focus on placing the Tz'utujil language at the center of the library's activity has been a conscious effort to stress its importance during the daily activities and services offered. Library staff are encourage to speak to users, especially children, in their native tongue. According to the library's Director, Israel Quic there are already tangible results being observed because of these efforts. He has seen that young children are much more confident using the language on a daily basis, especially when interacting with elders on the streets of San Juan. While much of the revitalization of the language is happening through verbal interactions, such as conversations or reading aloud, there are some attempts through the library to encourage the reading and writing of these Mayan languages. Quic managed the project that produced eight bilingual books, which were created by compiling oral histories from village elders. 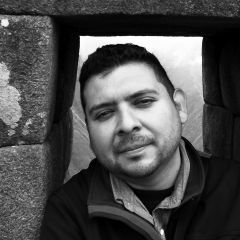 These stories were then transcribed and translated into Spanish. Katk'eje’ kaan paan awochooch, kateleel ja wi qas rajawaxiik chi aawe. Ma tak'iyaqeel ta ja mees pa b'eey k'in pa rub'eey ya’. Ma katt'iil apoon ta chi ruuchii’ nimaq taq rub'eey ya’, onwi chuchi’ chooy toq k'ojab’. Ta to'oo’ jun awach'alaal, awinaaq ja k'orpoqonaal nuutij. Ta k'olo’ kaan akant'iil, akantela, ab'ateriya, aradio ja nakoj pa taq q'aqaljab’. Ta poq'orsaaj ja ya’ natij utz k'a ma k'o ta yob'ilaal npit chawiij. Ta k'olo’ kaan tz'uuj rixin jab’, xarwari’ ta kuchu’ riij utz k'a ma ti tz'ilori. Ak'ama’ aayaa’ b'a ya'oon wi’ rub'ixiik rumaal ja Q'atb'al Tziij. RECOMMENDATIONS FOR RAINY DAYSStay inside, only go outside if absolutely necessary. Do not toss trash in the street or the rain stream. Do not go near dangerous places such as landslides, rivers, or lakes with raised water levels. Keep candles, flashlight, batteries, radio on hand in case of emergency. Filter or boil water for 15-20 minutes before consuming. Collect rainwater for consumption, but keep the water covered. Collect water from places authorized by the municipality. In addition to the blog, Quic also created a Facebook Page devoted to the language. He indicated that Facebook users from neighboring villages have been connecting with one another and participating on the page by contributing with comments and other postings. Quic has also started to tweet on his personal account (@maisquick) hoping that it will encourage others to tweet in Tz'utujil. 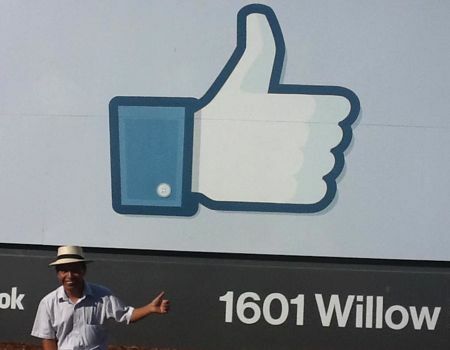 Israel Quic visiting Facebook headquarters. Photo by Quic and used with permission. In the near future, Quic hopes to organize a gathering at the library for those who participate on the virtual space in order to meet in person, where they will discuss ways to further revitalize this Mayan language using digital technologies and citizen media. Here is an audio podcast in the Tz'utujil language, where Quic invites people to visit the Community Library Rija'tzuul Na'ooj in San Juan la Laguna.